Charismag magazine recently published an interview with one of our teachers, Gianni Bodo. We proudly publish the full text here, with permission. Born of Italian of parents, Gianni Bodo has enjoyed a remarkable career for over two decades as a special educator, teacher and principal at École Socrates-Démosthène whilst pursuing a parallel career in the music industry. 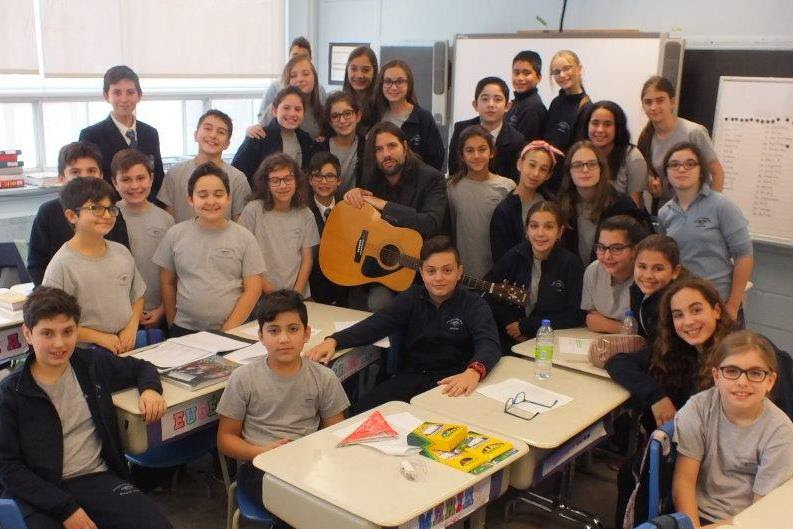 Despite his Italian roots, in recent years, he has zealously promoted the merits of the famed Greek school’s curriculum and has systematically acted as an ambassador for the proliferation of the Hellenic Community of Greater Montreal’s educational mission. His critically acclaimed debut solo album, Fade to Rose, features high-profile collaborations with, among others, Juno award-winning producer and songwriter Pierre Marchand (Sarah McLachlan, Rufus Wainwright) and has been featured on Musique Plus by Quebec’s most esteemed music critic, Claude Rajotte. Quebec Spot Media touted Gianni as one of 2014’s biggest musical revelations and in 2016, he earned a full-page feature in Panoram Italia magazine. In the summer of 2017, he was selected as one Italian week’s headline acts performing for several thousands in the heart of little Italy. Most recently, he was interviewed by Terry Dimonte on Chom FM in promotion of his show with Grammy-nominated Irish rock icon, Colin Devlin. cMag: As a person with many interests, what led you to pursue a career in helping children with learning difficulties? GB:. I guess it runs in my blood. My mother was a teacher for the CECM for over 30 years. Although she was never a special educator, she worked in a low-income neighborhood and school and has always had to deal with special needs kids. The truth is, I have always been more interested in music and the arts, but there was a strong parental force behind me, suggesting I should get a university degree if I intended to live a long and prosperous life! Ultimately, I believe that teaching is a calling, something you were born to do. It comes natural to me. It’s instinctive. cMag: Few individuals speak as passionately about Socrates-Démosthène, and the Hellenic Community in general, as you do – why? GB: I have been preaching and praising the merits of Socrates-Démosthène for more than 20 years. Very few schools in North America can boast a curriculum as strong and diversified as ours. I think what makes Socrates-Démosthène most endearing to me is the people and the environment. Over the years, many teachers have come and gone, but they all keep very fond memories of their time spent working for the Hellenic Community. Throughout my career, I have been a witness to the progression of the school model and in recent years to its ascending reputation as one of Quebec’s best private elementary schools. Children at SOC-DEM get it all: A quality trilingual education in a safe environment where family values and Greek culture rule. My eldest daughter graduated from Socrates II with honours last year and is now forging her own path in a highly reputable high school. It’s one thing to be preaching about the strengths of our school from the inside but it’s another thing recognizing its unbiased virtues through the eyes of your own children. cMag: What would you consider to be the advantages of being surrounded in a multicultural and multilingual environment? GB: Openness to the world!! Planet earth is getting smaller and smaller. The future belongs to those who embrace multiculturalism and multilingualism. Besides, in Montreal you can’t get a job at McDonald’s if you don’t master at least two languages! In the rest of the world, people who know several languages are offered greater opportunities. Although I cherish my Italian roots, I have always felt more of a Montrealer at heart. cMag: What are some of the notable differences between the Italian and Greek communities here in Quebec? GB: Oddly enough, for most of my adult years, I have been close to the Greek community. It is only recently, with my musical endeavours and success that I have discovered the depth of the Italian community in Montreal. There is no doubt that the HCGM’s educational system is looked upon with envy by the Italians. But as far as infrastructures and festivals go, the Italians are ahead of the game. Leonardo da Vinci Centre is magnificent and Italian week festivities are grandiose. I think those are some of the things the Greek community should be looking into. On a personal level, my significant other and most of my friends are of Greek origin. Even my kids are half Greek! So at this point, I really can’t tell the difference anymore! cMag: What is the significance/importance of music in your own life? GB: Music makes life exciting and memorable. Every important moment in my life is associated to a song or an album. At home and in the car we (my family and I) play music all the time! My daughters even wake up to the rhythm of Chom FM. In fact, I just picked up a new turntable so that we, as a family, could enjoy music in a more classic form. I want my kids to be connected with a time when it was still possible to build a physical relationship with music. When I’m not working or listening to music, I’m writing, recording, rehearsing and just doing what it takes to bring my art to next level. I am very grateful to be passionate about so many things. It makes living extraordinary. Music is my oxygen, my escape. cMag: What’s it like performing on stage? GB: Last summer I was invited to perform as one of the headline acts for Montreal’s Italian week. I don’t have words to describe the feeling and the thrill that washed over my body as I walked on this massive outdoor stage, crooning up and down the 40-foot catwalk, playing MY own songs before several thousands of people…doing my best impersonation of U2’s Bono! I was born to play this part! I think performing live, as daunting as it may seem, is where it’s at for me. If I could, I would be performing all the time. I am told that one of my greatest attributes is my natural stage presence and charismatic persona, but don’t take my word for it, you’ll have to come see for yourself. cMag: How important is it for children to participate in the arts? GB: Creativity is a key component in child development. The experience of making decisions and choices in the course of creating art carries over into other parts of life. Studies show there is an intimate correlation between art and other achievements. Not only do children benefit from boosts of self-confidence, kids that are able to experiment and make mistakes learn to innovate and to be free thinkers which extends way beyond the craft room and the classroom. To keep moving forward, society needs thinking, inventive people who seek new paths, not people who can only follow directions. cMag: How do you manage to keep a healthy balance between an exciting personal life, family and a successful professional one? GB: There is nothing more rewarding in life than following your passions and working on a dream but it takes a lot planning and a very compromising and loving spouse! When you’re out strumming your guitar or doing the socialite thing, the laundry, the homework and the housekeeping still need to get done. I try to do my part, but some of my responsibilities are often taken on by my better half. I am grateful. cMag: Of all your accomplishments, which would you consider to be the ones you are most proud of? GB: I think I’ve played an important role as school principal, in helping redefine a new educational vision for École Socrates-Démosthène and in changing popular perception. I am very proud of my work spearheading several work groups and programs such as: the Socrates-Démosthène Educational Plan, the special services plan, the anti-bullying prevention program, the linguistic policy, the Child Supervision Policy and several French language promotion incentive programs (Coccinelle-Épelle, Dromadaire vocabulaire, Radio Feta, etc.). I feel optimistic for the future of the School which I hold close to my heart and hope that I will have somehow contributed to its longevity and ever-glowing reputation. cMag: What are the most memorable moments of your artistic persona: how would you feel about your own children following in your footsteps? GB: When I was asked to perform for Italian Week, I thought it would be a good I idea to write a new song in Italian! Inspiration came quickly. So, I wrote a song titled “Stay in the Shadows” inspired by my children. The message of the song is simple. In this fast-moving world where social media can easily distort our perception of reality, I’m pleading with my children not to seek the limelight at every instant (as their father does), to wait for their moment. In a world of instant gratification, kids have to be patient and when it is truly their turn to shine their light will be brighter than anything in its way. That being said, during the first live performance of that song in Little Italy, I brought my eldest daughter up on stage and walked down the catwalk with her hand in hand. As far as artistic highlights go, that one was emotionally charged. Feeling like a rock star and an adored father in the same moment. It doesn’t get much better than that! As far as my daughters go as parents, our role is to shine the light on the road ahead knowing full well, as we have done before them, that our children will at times wander off the beaten path to stray into the darkness. That’s normal, they have to draw their own paths, make their own maps. I think we’ve given them a head start at Socrates-Démosthène, and now the rest is up to them. We must support them, guide them when we can, give them our love, cross our fingers and hope for the best! Speaking of hope, I hope they will always leave a little room for music in their hearts and they keep fond memories of their childhood. Life is good and I’m thinking the best is yet to come!